Donal and Myron are journalists who’ll go anywhere for a story. This summer, as tempers flare and riots are sparked in London’s heat, they get a lead they can’t resist. Not all the off-world immigrants are friendly. For every gas giant native who works in ballet or hospitality, there’s one who plots a takeover. Place hacking, augmented reality and student protests are all in a day’s work for the London’s Eye reporters. But when the trail leads to Rio and the Argentine Andes, have they finally bitten off a story too big to chew? This is a standalone novel within the series 'Dining Out Around The Solar System'. In a future where giant corporations run countries, all British Space Mines has to fear are journalists and hackers. Donal and Myron are their worst nightmare. When people from offworld races open ethnic restaurants in London, they meet a lot of opposition. Donal and Myron are their best friends. The London's Eye zine has vacancies. What do you think happened to their other reporters? 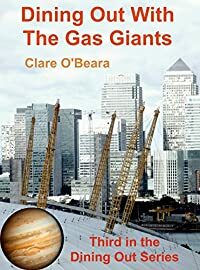 "If you enjoy suspense stories with science fiction twists, I believe you will find Dining Out Around the Solar System by Clare O’Beara to be your five-star cup of tea." D.S. Kane, author of Swiftshadow, DeathByte and Greynet in the 'Spies Lie' series. This book is a standalone read and follows DINING OUT WITH THE ICE GIANTS. By the Amazon No.1 Bestselling author of MURDER AGAINST THE CLOCK and MURDER AT IRISH MENSA.